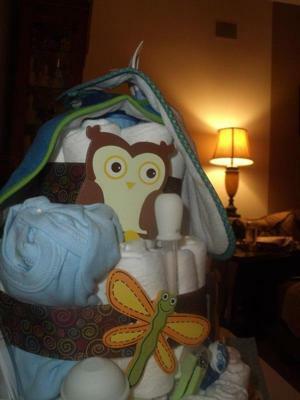 Such a cute owl diaper cake! The owls and the dragonfly are adorable! Made with a lot of TLC, this sweet diaper cake made a heart-warming gift for a special mother-to-be in Pennsylvania. 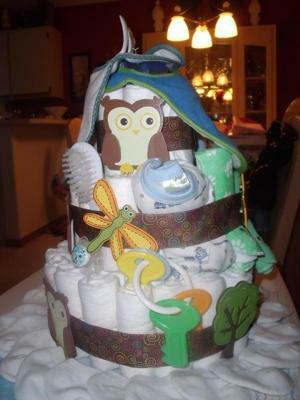 Jean created this cute diaper cake and then shared it with all of us here, thus adding her creativity and unique ideas to our amazing collection of one-of-a-kind diaper cakes! We love our readers and are so grateful that they are "paying it forward"! So amazing! Thanks so much Jean! 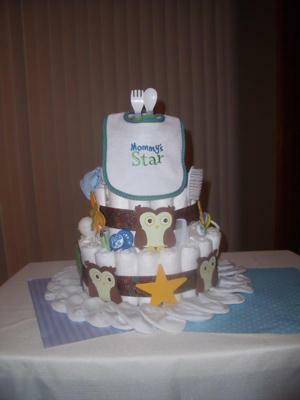 Submit your diaper cake right here! I made this cake in Florida and shipped it to Pennsylvania. The Mother-to-be was very surprised to receive it. 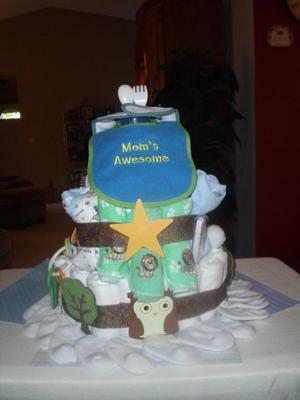 It is a three-tiered diaper cake. I started with a bottle of baby lotion for the core. I then rolled and wrapped each diaper into a cylinder with a rubber band. I rubber banded the baby lotion and the first ring together to make a circle, then continued with the outer two rings and then placed a large rubber band around all three rings. The first row had three rings, the second two and the third row one. I then placed the ribbon around the rubber bands so they would not show and placed items that the Mom and baby would use into each section. I used a 14" round cardboard cake display for the first tier to sit on. I then placed baby socks around the bottom to make it look like it had a fancy edging.